There are many ways to hold strip planks in place while the adhesive between them cures. The best method for your project depends on how you plan to finish it, what fastener equipment you have on hand, and how much holding power you need to keep the strip planks in place. If you will be finishing your project clear, you must consider how the holes left by the fasteners will look. The appearance of fastener holes is less important if you are going to paint your project, apply heavy fiberglass or add a layer of wood. If this is the case, choose a fastener you can drive and remove quickly. Drywall screws, staples or brad nailers will do the job for you. You’ll find drywall screws convenient for heavy strip plank projects that require extra holding power. They are inexpensive, reusable and a delight to work with, especially if you are using a cordless driver. Screw them in at a slight angle to force one plank to nest against the previous. This forces excess adhesive out of the joint, reducing project weight. Driving screws is slower than installing fasteners with pneumatic tools, and may unsuitable for clear-finished projects unless you drill and plug the holes. Brad nailers and staplers let you rapidly install and remove fasteners, but do not offer much drawing power. Use them when you don’t need much force to hold planks in place. To use these air-operated tools, hold the wood strips in position before driving the nail or staple. The fastener will not draw the plank against the mold frame on its own. If you need a lot of holding power, use drywall screws or drive the staple or brad nail through a wooden or plastic spacer. This lets you drive the fastener home against the spacer block, and easily remove it later. If you’ll be finishing your project clear, you’ll want your fastener holes to be small and less noticeable. Wide crown staples are good for holding 1/4″-thick wood strips in place. Many builders prefer them for building strip plank canoes. They install quickly and hold reasonable well. In skilled hands, wide crown staplers install quickly with little damage to the wood strips. Be sure to drive the staples proud of the surface, rather than flush or below it. The photo (gallery below) shows fastener damage of each style fastener. If you must drive the staples hard against the wood to gain holding power, do it through a thick piece of plastic, such as a piece cut from a plastic squeegee. The plastic will stop the staple from crushing wood fiber, and let you remove the staple without harming the wood. The photo shows a variety of ways to protect the wood from fastener damage. Narrow crown fine wire staples also work well for clear finish projects using wood strips around 1/4″ thick. 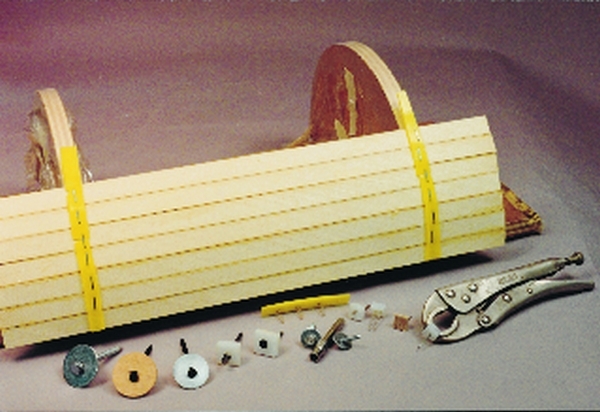 The narrow gauge wire will mar wood less than most other fasteners. As with wide crown staples, you must drive the staple proud of the surface. Prevent damage by stapling through stiff plastic strips, which protect the wood and let you easily remove the staples. Narrow gauge wire brads (small nails) are another option for clear finish projects. Brads are available in 20 gauge (.038″ diameter) and 7/8″ long. This is long enough to temporarily hold strips in place. Combined with a wooden or plastic spacer, brads hold very well and leave only one hole. Wooden spacers make removal easy because you can grab them with pliers. They also pad the fastener head and prevent scarring of the strips. You can repeatedly reuse spacer pads with the brad nails still attached. For projects that cannot tolerate any fastener holes, use hot melt glue to hold glued strips against mold frames. First secure the strips in place with spring clamps, then apply hot melt glue to the back side of the wood strip alongside each of the mold frames. After the hot melt glue has set up 2 or 3 minutes, remove the spring clamps, fit another plank and glue it in place. When you’re done planking, cut the hot melt free of the mold frames. Be careful not to damage the planks. 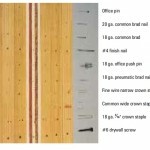 Scaffold nails (double headed nails) are still used on some large strip plank projects. They hold very well and are easy to remove with a claw hammer or crow bar. Nails are not as popular as they were in the past because drywall screws and pneumatic nailers are more efficient. 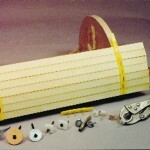 A variety of wooden, plastic and metal washers or spacer pads. When used with nails or staples, they can be easily removed with pliers. The prevent damage to soft wood strips and they can be reused. Unfilled holes from a variety of fasteners as they appear under a clear finish. They can be made less visible by filling in with an epoxy/406 Colloidal Silica mixture tinted wit wood sanding dust.